Xarelto is a prescription blood-thinning drug manufactured by Bayer and Johnson & Johnson via Janseen Pharmaceuticals, Inc. The drug received initial FDA approval in 2011 for knee and hip replacement patients. It was quickly approved to help prevent strokes in individuals with abnormal heart rhythms. Unfortunately, Xarelto was soon linked to a number of dangerous side effects. If you or a loved one has been injured by Xarelto, give us a call or use our private contact form. We can help. 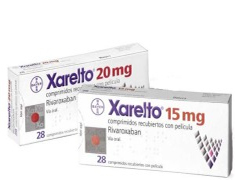 Xarelto can cause uncontrollable internal bleeding. The main problem with Xarelto is that it can cause internal bleeding, and this happens because the drug acts by preventing the blood from clotting. The leading blood-thinner before Xarelto was Warfarin. Warfarin was problematic because it was difficult to administer, required lifestyle changes by the patient, and it interacted poorly with other drugs. It also caused occasional uncontrollable bleeding in the body. Xarelto solved many of the problems associated with Warfarin, but increased the danger of internal bleeding. Bleeding caused by Warfarin can be stopped by dosing the patient with Vitamin K, but bleeding caused by Xarelto has no known fast-acting antidote. There is no Xarelto class action lawsuit at this time. However, most large-scale defective drug cases end up as part of a Multi-District Litigation (MDL). MDLs streamline litigation and reduce costs to injury victims. Each case in the MDL is handled individually, but all cases are before the same court and subject to the same rules and court orders. Therefore, it is possible for each case in an MDL to settle for different amounts of money. All Xarelto lawsuits were transferred to the Eastern District of Louisiana in December, 2014, as MDL 2592. Want to find out if you or a loved one has a Xarelto claim? Please feel free to contact a Xarelto attorney using the form below or by dialing1-877-542-4646. One of our experienced Xarelto lawyers will help evaluate your claim and explain your legal rights for free. McSweeney / Langevin is providing consultations to individuals throughout the United States. Information provided by email or phone will be kept confidential.